Take a plain or tired old T-shirt and perk it up with stenciled designs. These super-easy embellishments are a great way to rescue a T-shirt that has been stained. The same technique can be used to stencil sweatshirts and sweatpants—just about anything made of fabric. 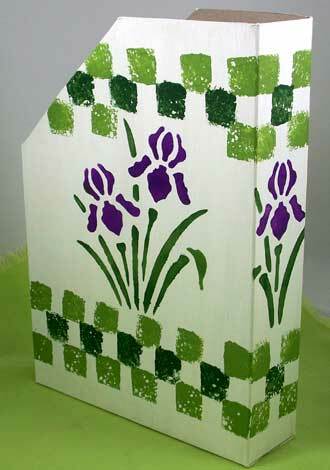 Related crafts: Make a batch of greeting cards in a hurry with stenciling. Learn how in the Stenciled Cards tutorial. Or see the Stenciled Flower Pots project for ways to decorate plastic, and for more printable stencil patterns. 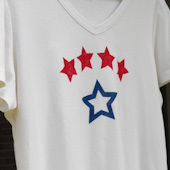 Make a special Fourth of July T-Shirt with stenciled stars. Thoroughly wash and dry the T-shirt to remove any sizing. Pin the T-shirt to the plastic-covered tack board or corrugated cardboard—be sure the T-shirt fits with a little room to spare. First, place a few layers of newspaper or freezer wrap inside the T-shirt to prevent paint from going through to the back of the shirt, smooth the T-shirt, then use straight pins to hold it taut. Select a stencil pattern and print it. The Fish Stencils pattern includes a one-part fish stencil and a two-part fish stencil. Print and cut out the two-part stencil twice—once for the fish body and again for the stripes—stencil in two contrasting colors. 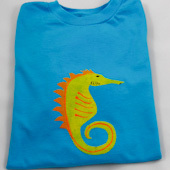 The Seahorse Stencils pattern includes seahorse stencils in two sizes. 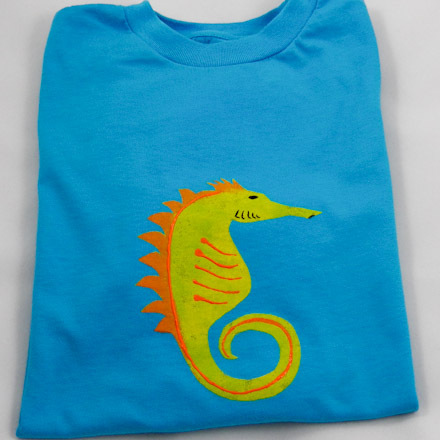 The Smaller Stencils pattern has fish and seahorse stencils reduced in size to better fit kid-size T-shirts. Use the Star Stencils to quickly covered a stain and to make patriotic T-shirts in red, white and blue. The MOM Stencils are perfect for Mother's Day—make t-shirts for the kids (and Dad) with 'I heart MOM' and one with just 'MOM' for their mother. Cut on the rectangle around the stencil, then cut out the gray areas of the stencil. When using stencil paper or vellum, trace the pattern onto it. Or place the printed pattern behind the stencil paper or vellum, and cut on a cutting mat or thick piece of cardboard using a craft knife. Tip: Computer paper works fine for stencils, but may wrinkle when wet, and can only be used a few times. Special stencil paper or film is available at craft and graphic arts stores. It cuts easily, doesn't tear, and lasts almost forever. 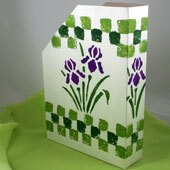 Artist's vellum also works well for stencils, and be purchased at craft and art supply stores. Tip: You can use a commercial stencil. They come in many designs and sizes and can be purchased at craft stores. All of Aunt Annie's project patterns are designed to be printed on standard letter-size paper (8.5"x11" or A4). When printing from Adobe Reader, you may need to select Auto-Rotate and Center or Choose paper source by PDF page size to ensure the best fit. Spray the back of the stencil with repositionable spray adhesive, following the manufacturer's directions. Decide how many times you will stencil the design on the T-shirt, and where each design will be placed. 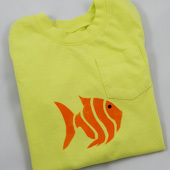 You might stencil three fish down one side, or three across the chest, or three along the shirt's bottom. You can place the designs perfectly straight or rotate each one in a slightly different direction—it's up to you. Place the stencil on the T-shirt in the first position—work from top to bottom and left to right (or right to left if you are left-handed). Tip: A strip of masking tape applied to the T-shirt can be used as a guide in placing the stencil. Squeeze fabric paint onto a plastic lid or plate. Dip a stencil brush or dampened sponge into the paint. Remember that stenciling is done with a nearly dry brush, so dab off any excess on newspaper or a paper towel. Also, be sure to use a brush or sponge of an appropriate size for the stencil. Stipple the paint through the stencil cutouts with an up-and-down dabbing motion. Stop after one color, or apply other colors through the stencil as desired. 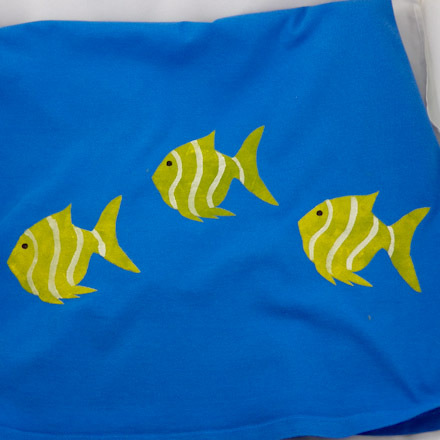 You might stencil the fish in white, and then accent the tail and fins with a bright color. Carefully remove the stencil to avoid smudging the paint edges. Apply the stencil again to repeat the design on other parts of the T-shirt. When you are completely done painting, cure or set the paint according to the manufacturer's instructions. Apply the paint very lightly to avoid making the T-shirt fabric stiff. Use fabric paint (or liquid embroidery) straight from the bottle to add accents on the fish—eyes, stripes, outline, etc. A sponge roller can be used to apply paint on larger stencils. It will make the work go faster. For a wider range of colors, you might try textile medium mixed into acrylic paints. Textile medium is made by most of the major craft paint manufacturers, and will be available in a rack near the acrylic paints. That's it! Your T-shirt is done! 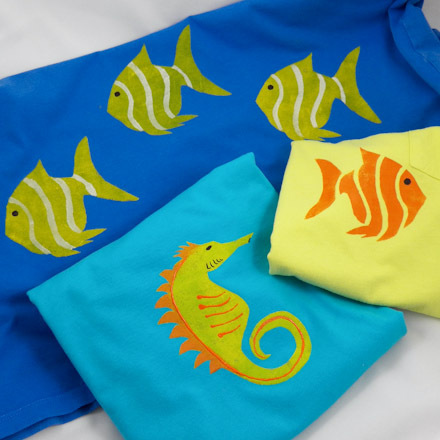 Tip: The Fish Stencils pattern includes a two-part stencil. First stencil the entire fish, then stencil the stripes. Two-part stencils are more difficult than one-part stencils because they require careful placement of the second stencil. Tip: Permanent markers can be used to add detail, like the eye on this fish. Tip: Add details to a stenciled design with fabric paints or liquid embroidery. 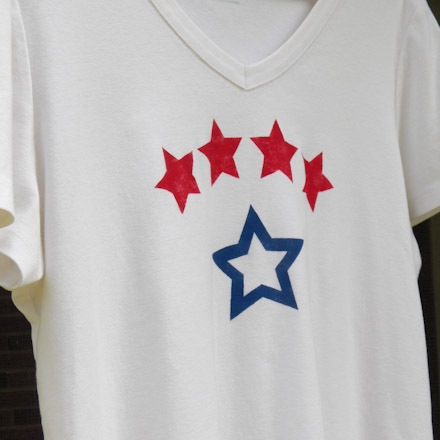 Tip: Stencil stars in one or two sizes to make a T-shirt for the 4th of July. The large star with a white center was made by applying one of the smaller star cutouts in the center of the stencil. Related project: Stencils can be used to decorate many items. 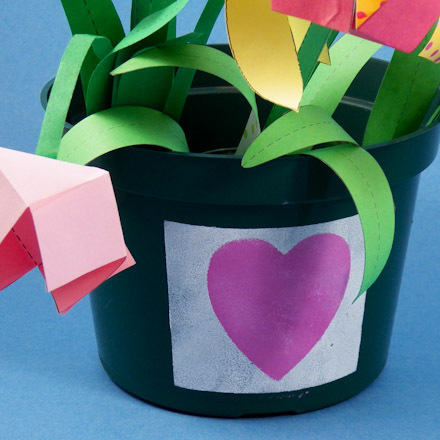 See how to make this Magazine Holder made from a recycled cereal box. Related project: Checkout the Stenciled Flower Pots project for how to stencil plastic containers.